Mangore | Bellucci Guitars - Herberg & Arlan, "Somewhere Over the Rainbow"
Herberg & Arlan, "Somewhere Over the Rainbow"
A beautiful piece from the movie "The Wizard of Oz""Over the Rainbow" (often referred to as "Somewhere over the Rainbow") is a ballad, with music by Harold Arlen and lyrics by E.Y. Harburg. It was written for the movie The Wizard of Oz (1939) and was sung by actress Judy Garland, in her starring role as Dorothy Gale. The song won the Academy Award for Best Original Song and became Garland's signature song, as well as one of the most enduring standards of the 20th century. 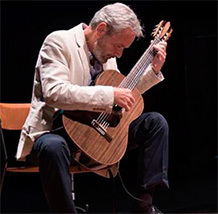 The main challenges of the transcription consist in avoiding string squeaks at all costs and to be very fast between the changes of position on the different sectors of the fingerboard. Leave nothing to chance and you will do just fine. S.D.G. Renato Bellucci plays: "Over The Rainbow" S.D.G." Asuncion, 5 de Septiembre de 2016, S.D.G.